불국사 강당 뒤쪽의 보호각에 보존되어 있는 사리탑으로, 「불국사사적기(佛國寺事蹟記)」에서 말하는 '광학부도(光學浮屠)'가 곧 이 사리탑을 가리킨다는 견해도 있지만 현재로서는 여래의 사리탑인지 승려의 사리탑인지는 분명하지 않다. 겉모습이 석등과 비슷하게 생긴 사리탑으로, 사리를 모시는 탑신(塔身)을 중심으로 아래는 받침이 되는 기단(基壇)을 두고, 위로는 머리장식을 두었다. 기단은 연꽃잎을 새긴 반원모양의 돌을 위 · 아래에 두고, 그 사이를 북(鼓)모양의 기둥으로 연결하고 있는데 기둥에 새겨진 구름무늬에서 강한 생동감이 묻어난다. 탑신(塔身)은 가운데가 불룩한 원통형으로, 네 곳마다 꽃으로 장식된 기둥모양을 새겨두었다. 기둥에 의해 나뉘어진 4면에는 감실(龕室:불상을 모시는 방)을 안쪽으로 움푹 파놓은 후, 그 안에 여래상(如來像)과 보살상(菩薩像)을 돋을새김하여 모셔놓았다. 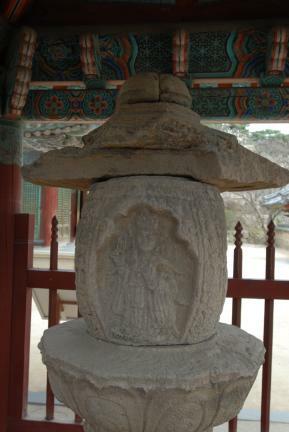 지붕돌은 추녀끝에서 12각을 이루다가 정상으로 올라가면서 6각으로 줄어든다. 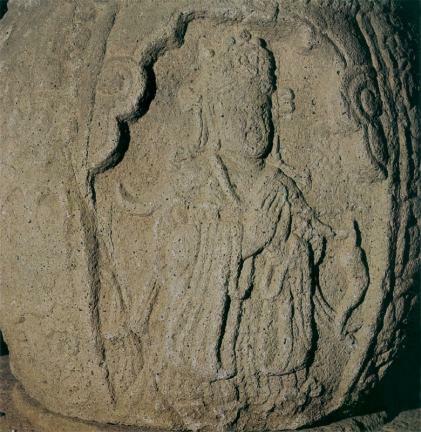 경사면은 완만하며, 꼭대기의 머리장식은 일부만 남아있다. 평면이 8각인 기본형에서 벗어나 새로운 형태를 보여주는 것으로, 화려한 조형과 섬세한 조각수법으로 보아 통일신라의 양식을 계승한 고려 전기의 작품으로 추정된다. 1905년 일본인에 의해 동경의 우에노(上野)공원으로 불법 반출되었다가 1933년에 반환된 것으로, 일제시대 당시 모진 수난을 당한 우리 문화재의 아픈 역사를 잘 말해주고 있다. 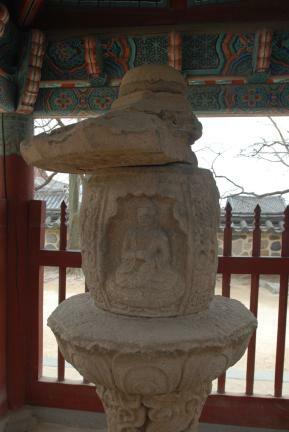 This stupa is housed in a protective building at the back of Bulguksa Temple's lecture hall. 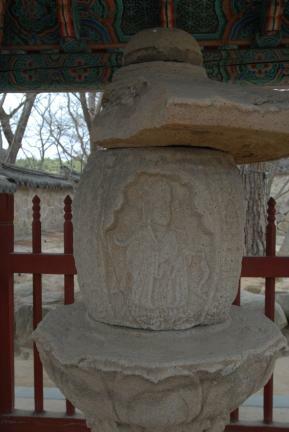 It is said that the stupa contains either the sarira of eight Buddhist Monks or the sarira of a queen who entered the Buddhist monkhood upon the death of her husband, King Heongang. 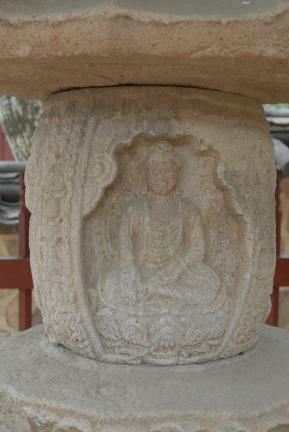 Consisting of pedestal, main body and ornamental capstone, this stupa resembles a stone lantern. 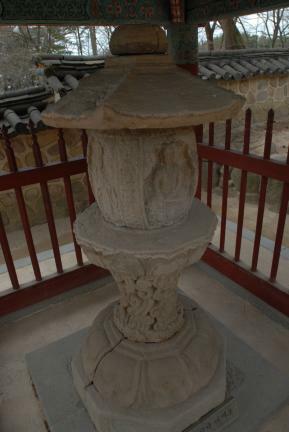 The pedestal is composed of two semi-circular stones - each carved with a lotus flower design on its octagonal ground stone - that are connected with a drum-shaped pillar bearing a vivid cloud design. 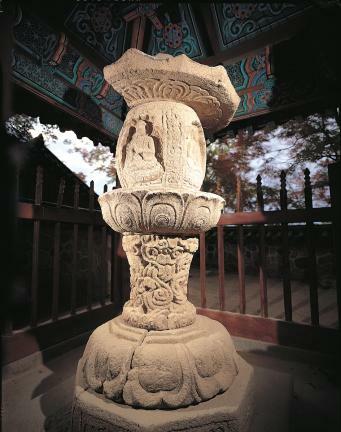 The main body of the stupa is cylindrical, and is carved with four-pillar patterns decorated with flower designs. 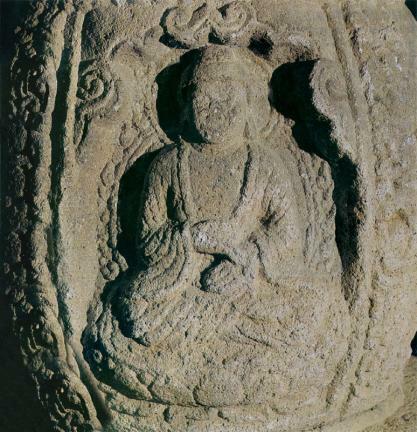 The four sides divided by the pole patterns have niches embossed with images of Buddha and bodhisattvas. 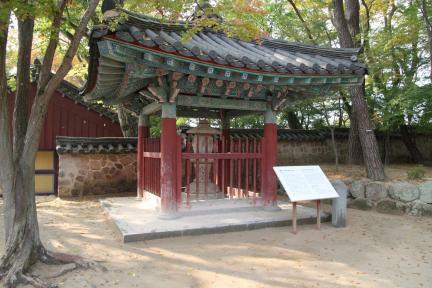 The roof has twelve angles on the edges of the eaves but the top of the roof is hexagonal. 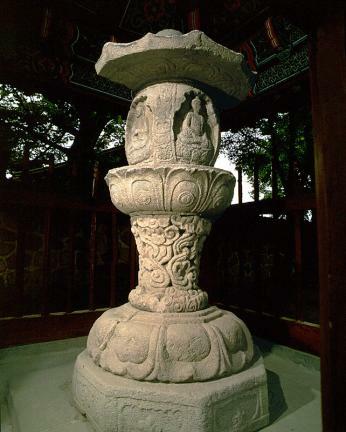 The roof slopes gently; and only part of the finial remains. 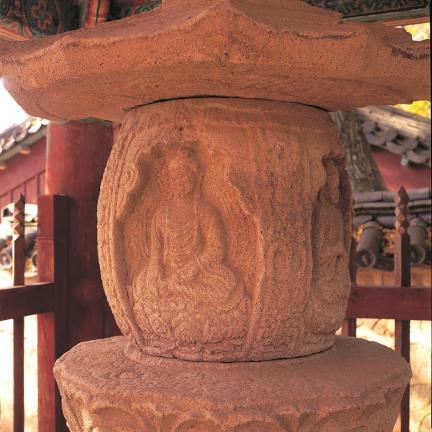 The profoundly beautiful style and delicate workmanship of the stupa indicate that it was made in the early Goryeo Dynasty while retaining certain features of the Unified Silla style. 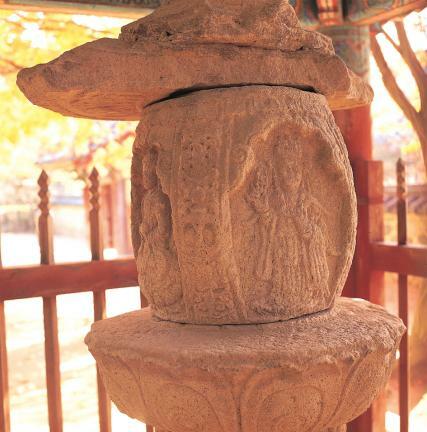 In 1905, the stupa was taken out of Korea to Ueno Onshi Park in Tokyo by the Japanese, and was returned to Korea in 1933.